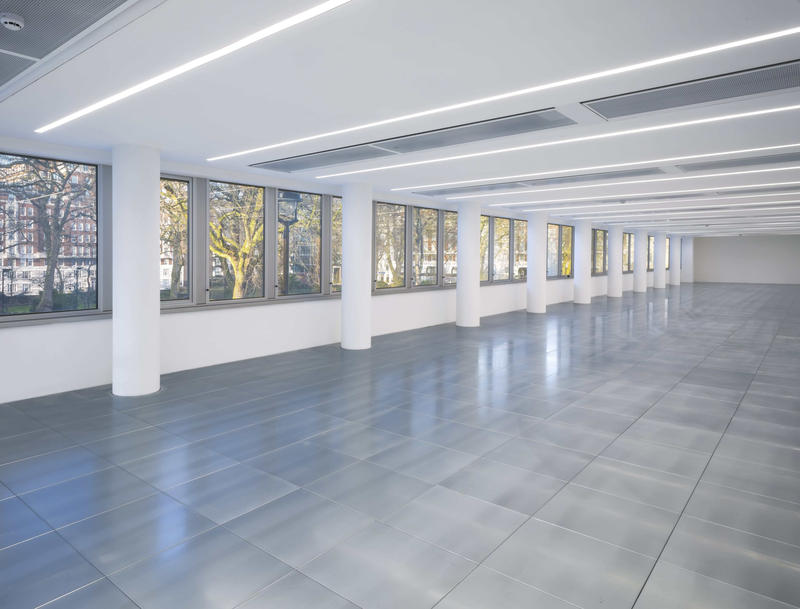 A newly refurbished, contemporary office building by Great Portland Estates plc, on a prominent corner of Portman Square. 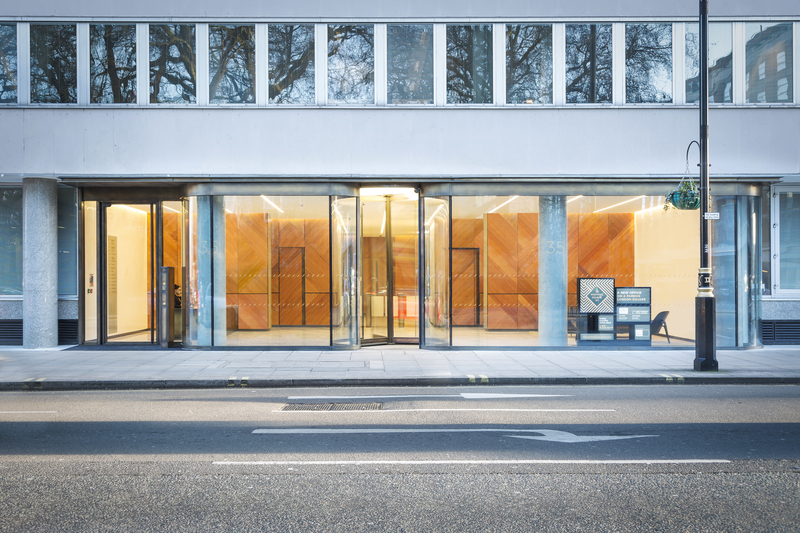 This building’s reception has been comprehensively remodelled, improving the arrival experience for staff and visitors. 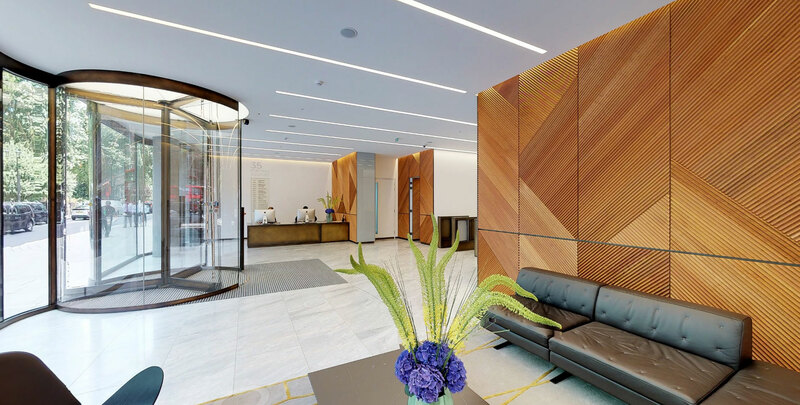 Articulated in a contemporary way this confidently-styled reception includes finishes of pale grey Azul Cielo Italian marble and bright white polished plaster offset by bespoke American Black Cherry timber panelling and patinated brass. 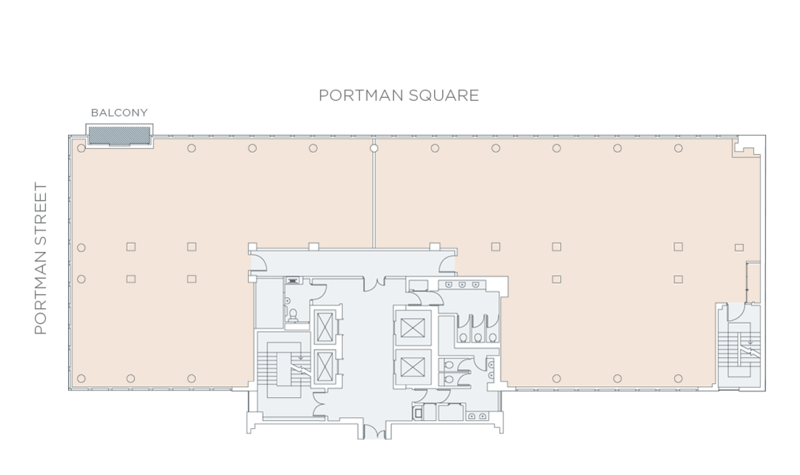 Tenants of 35 Portman Square have exclusive access to one of London’s most elegant garden squares; Portman Square itself. 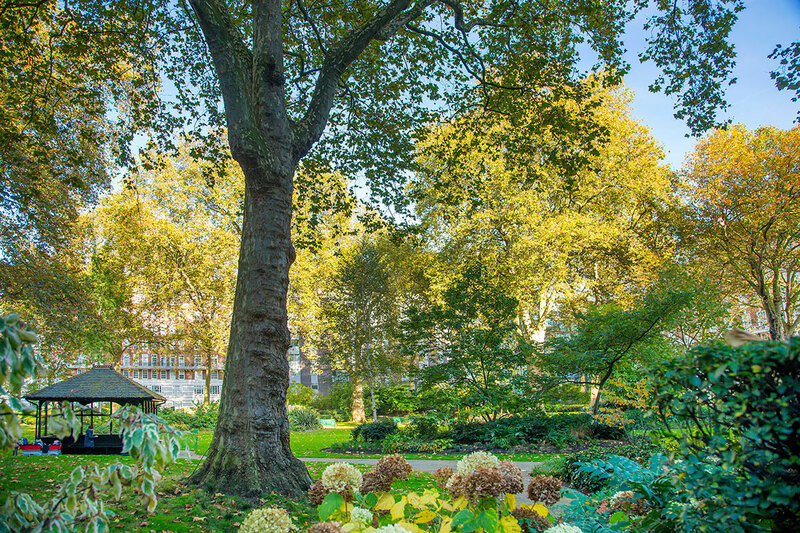 Secluded and peaceful, Portman Square is a private garden square covering nearly 1 hectare. It offers a tranquil haven for the building’s staff to enjoy. Shaded by magnificent London plane trees, the garden has a generous lawn, winding paths and a tennis court. Portman Square is surrounded by a distinguished mix of traditional listed houses and more contemporary office buildings, with the Churchill Hotel and renowned private members’ club Home House located on the square itself. 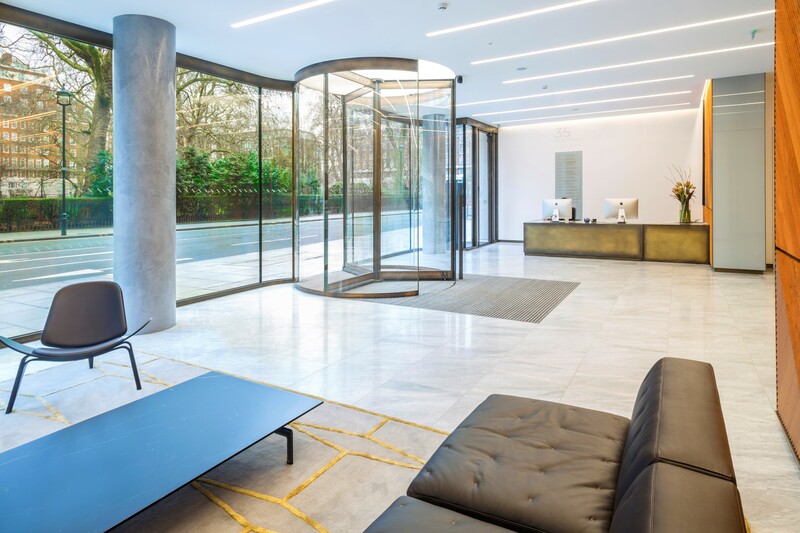 Marylebone is widely acknowledged as one of the capital’s most contemporary and vibrant neighbourhoods. Rich in beautiful buildings, exclusive shops and fine restaurants, it is bordered by the grandeur of Mayfair to the south and London’s most beautiful green spaces, Regent’s Park and Hyde Park to the north and west. The Elizabeth Line arrives in 2019 and will run east to west across London, improving transport links at the nearby Bond Street station. The newest addition to the capital’s tube network will further enhance connectivity in the area, which already benefits from excellent transport links. Up to 24 trains will travel in both directions every hour, supported by two new ticket halls at Davies Street and Hanover Square.  Colliers International, and its joint agents, BNP Paribas Real Estate, give notice that these particulars are set out as a general outline only for the guidance of intending Purchasers or Lessees and do not constitute any part of an offer or contract. Details are given without any responsibility and any intending Purchasers, Lessees or Third Party should not rely on them as statements or representations of fact, but must satisfy themselves by inspection or otherwise as to the correctness of each of them. No person employed or engaged by Colliers International, or its joint agents, has any authority to make any representation or warranty whatsoever in relation to this property. (October 2017) Colliers International is the licensed trading name of Colliers International Property Advisers UK LLP which is a limited liability partnership registered in England and Wales with registered number OC385143. Our registered office is at 50 George Street, London W1U 7GA.